Baby carriers: an addiction or a necessity? 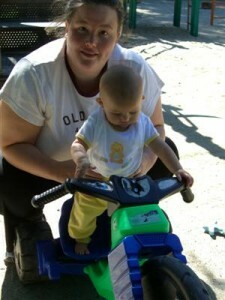 I like wearing my baby and Josie likes it a lot more than the stroller as well. Turns out they make many different kinds of carriers for different situations. I’ve loved my Moby wrap to start with. 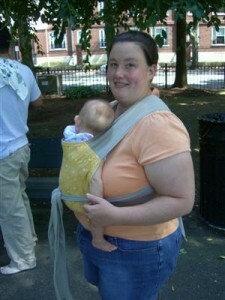 We never really got into the sling as the one sided carrier isn’t comfortable. Now I’m exploring Mei Tai’s, Ergo’s and Beco Butterfly’s. 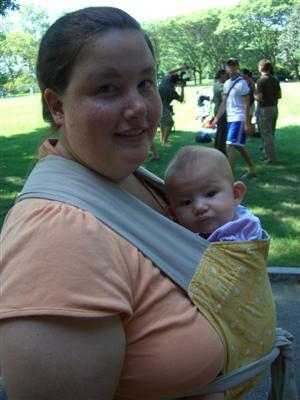 I borrowed the EllaRoo carrier (pictured below) from the Boston Babywearers group and both Jordi and I are liking it pretty well. It is lightweight, uncomplicated and Josie seems to like it. Josie and I liked the Ergo, but Jordi seems to be less fond of it when we tried it. I’m trying to find a local Beco Butterfly so I can try it before I buy it. Eileen also introduced me to the idea of a sash carrier, which I’m now really interested in as it combines the best of the Moby wrap (poppability of baby in and out of the carrier) with the less fabric of the Mei Tai for shorter trips. On the good advice of friends we ordered our crib when I was about 6 months pregnant, brought it home and put it all together to make sure it was good. And in the basement it has sat until this past weekend. I found Josie was waking herself up because she was running into the walls of her bassinet as she moved in her sleep. (She now rolls over to sleep on her side, it is super cute) We took it apart, and moved it upstairs to the bedroom and she successfully slept it in, enjoying her new roomy digs. She continues to be teething like the dickens so she’s chewing on her phone in the picture. We’ve found Hyland’s teething tablets are helping nicely to get us all some more sleep, although it doesn’t really stop the drool. We went to the playground last weekend and Josie couldn’t take her eyes off this Big Wheel. I think we’ll be seeing one of these in her future, once she can, you know, reach the peddles, seat, and handlebars all at the same time. Earlier this month we celebrated my mom’s birthday with Josie decked out in one of her crazy fancy dresses per my mom’s request. We went out to a yummy dinner where we found that Chinese soup spoons (flat bottom plastic ones) are great for a teething baby to gnaw on and entertain herself with. 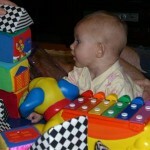 One of the photos below shows Josie with one of her favorite toys, a dog shaped xylophone. At this point she has to be held upright to play with it though, which is tiring on the back! She also likes to knock down the towers of blocks, our own little Godzilla. 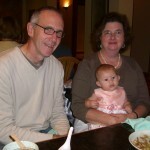 A few weekends ago we went to Rhode Island to celebrate Koos’ birthday with friends. It was a baby jamboree with six under a year old. The toys were heartily passed around and we got to take Josie “swimming” again in a little pool. She liked to watch the water and eventually decided to sit down. Since everyone else has already posted pics of all the babe’s sitting nicely on the couch, I thought I’d show one of the action shots where everyone was involved in their own drama. Josie as usual, refused to sit. I think the shot was taken right after Xander went for his head dive off the couch. MiniWear (babies r us brand) – These things are tiny. Josie is growing out of a 9 month size pajamas already in every dimension and other things we’ve worn were way undersized. Maybe they just shrink too much or something? Gerber – these onesies are itty bitty, already in 9 months size soon onto 12. 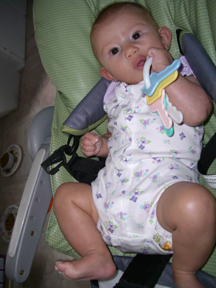 Old navy basic pants – from the very start these things couldn’t really even fit over her cloth diaper bum. They are just tiny. Are the jeans any different in your experience because I’m thinking of picking some up for fall? Carters – For Josie these seem to be fitting pretty well on track, are proportioned well enough, if not a bit wide for her thin frame. Works well over the cloth diapers as such. On the edge of the 6 month size moving into 9 month. and aren’t super wide across the torso. Her bathing suit fits well too. Vitamins – While some of the outfits seem average proportion, these clothes might best be suited towards wider kids. She’s just wearing 9 months size now and they are roomy in the width, but not in the length. The quality is nice on these too. Koala kids – These outfits are again wide for Josie without being roomy enough in the length. Quality is good too. I don’t have enough experience yet with children’s place, gap, gymboree, and janie and jack clothes. Maybe others have opinions? In the end, I often find myself reaching for the carters stuff for a single piece outfit because it is proportioned well and is surviving many washings while staying soft. For separates she has a lot more flexibility in their fit, and those outfits are getting worn their fair share. I’m looking forward to winter dressing with the cute different layers although I’m sure I’ll be cursing all those layers when changing diapers. That’s ok because I just washed a bunch more new bigger one piece carter’s outfits! This blog has been quiet for a little while as I’ve fallen behind documenting our adventures with Josie. The short of it is that she’s had another cold and her lack of sleeping has continued until the last couple of days where she now _only_ wakes up 3 times a night, which allows me to feel mostly human. For the record she used to only get up once or twice, how we long for those days! My grandmother also came to visit which required a lot of attention and schlepping out to my parents house for visiting. So what’s new you ask? Josie can now grab things with decently good accuracy and manipulate toys. This has been fabulous when it comes to her entertaining herself in the car playing with toys. She will grab your hair and your glasses and she’s caught the cats a few times. Thankfully she doesn’t pull much yet. Elephants thankfully have lots of great places to grab. This Thursday, August 7th, Josie completed another major milestone. She rolled over from her front to her back! She has previously done it a) with help or b) on a incline. This time it was on flat ground with no one touching her, so it is legit! Then she did it again on Friday morning so Jordi could see and so we could video tape it. You’ll have to nag Jordi to get the video though, as she’s in the buff so we won’t be putting it on the internet for eternal posterity. 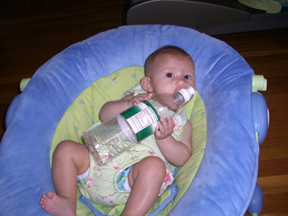 Josie has been exploring new toys like water bottles and her sippy cup, not that she’s actually drinking from them. Teething continues and is making for some rough nights these days. She reverted Saturday night to a newborn sleeping habits and woke up 6 times in 8 hours. This Tuesday Josie turned 3 months old. First the facts, she weighed in at 12 lbs, gaining 15 oz since the previous month. This month has been filled with wonderful and less wonderful experiences and some new skills. Last week Josie caught her first cold which was not so fun, but she kicked it pretty quickly. Some combination of growth-spurt, teething, and that cold have turned her output into some funky and surprising colors, but the doc says they are all normal. She is definitely having a growth-spurt this week as she just can’t eat enough some days, we’ll see how much longer the 6 month clothes fit! Hopefully another month since they’re all summer stuff. Her grabbing skills have improved greatly to the point of where she can sometimes play with her toys in the car for a short ride without getting upset. She has also started attempting to sit up, bringing her head forward in her car seat and other chairs. Her favorite book currently is “Baby Faces“. “The very hungry caterpillar” and “Este no es mi coche” also hold some attention. You are currently browsing the JenJordi.org weblog archives for August, 2008.